If you are going to Vienna in Austria, you should spend at least a day on the trail of Empress Sisi. Empress Elisabeth of Austria (Sisi) was an intensive traveler though, so you can follow in her footsteps not only in Austria (where she lived after her marriage with Emperor Franz-Joseph) and in Germany (Bavaria, where she was born). You can find her trail all over Europe and beyond. During her life Sisi's travels are numerous and in the last years of her life she is almost always on the way, or on the run if you like! To escape the stifling protocol of the court in Vienna, Sisi embraces every opportunity to get away. Many of her journeys are health-related, as she travels around Europe to find relief for numerous illnesses. Of course she also travels for political reasons, for instance to Hungary and Italy. For the restless Sisi the journey is always more important than the destination. The euphoria of reaching a new destination doesn't last long, and although some places she loves more than others (Corfu, Hungary) she never finds rest anywhere. Discover the Vienna of this tragic empress by visiting the Schonbrunn and Hofburg palaces, Sisi Museum and other highlights of Vienna. You can also combine these and other features in this great Sisi adventure. You can spend a day as the Empress of Austria, visiting the palaces where she lived, enjoy an elegant dinner and visit a 17th century-style classical concert. 15 km south of Vienna you will find Schloss Laxenburg. It is an impressing castle where Franz Josef and Sisi spend their honymoon here, and both Gisela and crown prince Rudoplf were born here. Sisi loved Tirol and Karinthie. It reminded her of the Bavarian mountains from home. 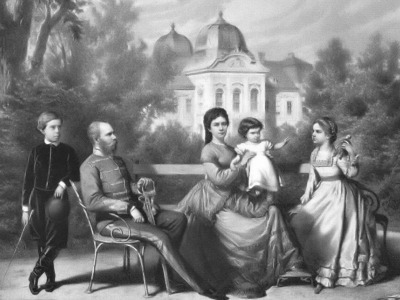 She was fond of the Kaiservilla in Bad Ischl, an engagement present from Archduchess Sophie for the engagement of Franz-Joseph and Sisi. The couple met here and their engagement had taken place in the Kaiservilla. Another way to get on the trail of Empress Sisi is meeting a real life ancestor of hers. Her great-great-grandson Christian Count Stolberg-Stolberg is lord of the castle hotel Jagdschloss Kühtai in the mountains of Tirol. All spaces in this beautiful castle hotel will remind you of the history of the house of Habsburg. 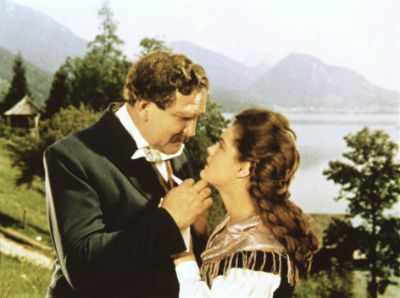 Gustav Knut and Romy Schneider as Sissi and her father in the film. On the background is lake Fuschl, acting as Lake Starnberg in Bavaria. Another great place to visit in Austria is Schloss Fuschl, a luxury hotel nowadays. In 1955 Ernst Marischka, the director of the famous Sissi films, choose this location as a stand-in for Schloss Possenhofen, the place where Elisabeth was born and raised. In Marischka’s opinion, the original location was not idyllic and fantastic enough! But he is right about one thing, it is a beautiful and spectacular scenery. In the hotel’s Sissi suite Romy Schneider slept when they were shooting the the Sissi film about the famous Austrian empress. There is a luxurious hotel shop/ Sisi Museum where a few pieces from the real Sisi are on diplay. In 1860 Empress Elisabeth sailed to Madeira on the Royal Yacht "Osborne", which was lent to her by the English Queen Victoria. Her doctor feared that she might have tuberculosis, and advises a change of air, which advise she gladly accepted. She spends 6 months on the island, away from husband Emperor Franz-Joseph and her children (Sophie had died already in 1856). On 24 December 1893, on her 56 birthday, the empress arrived on Madeira again. Upon arrival she was given an imperial salute by British naval vessels. They would continue doing so every morning for the full duration of her stay. During this stay Empress Elisabeth was a guest at Reid's Palace for various weeks in 1893–1894. She stayed in a suite on the ground floor of today's historical wing. 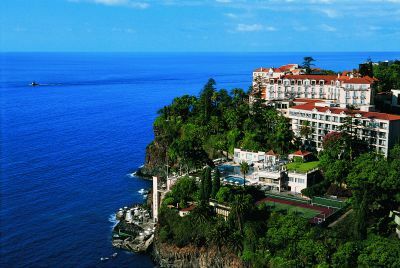 You can still spend your holiday in this luxurious hotel, overlooking Funchal and the Atlantic Ocean. Of course in the top of my list since I am from the Netherlands myself! Both in 1884 and in 1885 Empress Elisabeth stayed several weeks in the Netherlands. She came to visit doctor Mezger, one of the founders of physical therapy, a famous doctor of the rich and famous in those days. He treated many patients of high nobility in the Amstel Hotel in Amsterdam. Elisabeth hired forty rooms in the Doelen Hotel and following the prescriptions of doctor Mezger, the bath in the hotel was filled with seawater every day. Both the Doelen and the Amstel hotel are still in business and well located luxury hotels in Amsterdam, wonderful to spend a few days. 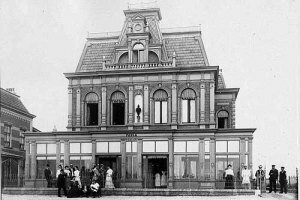 The Empress also stayed three weeks in hotel Kaufman and in Villa Paula in Zandvoort. Both places are gone. The beautiful Boulevard of Zandvoort, with major hotels and beautiful guest houses, which made it a famous seaside resort, was totally demolished by the Germans in the Second World War. In total 648 buildings were demolished to make way for the Atlantic wall. During her stay in he Netherlands she visited ‘t Loo Palace and had diner at Hotel De Keizerskroon. 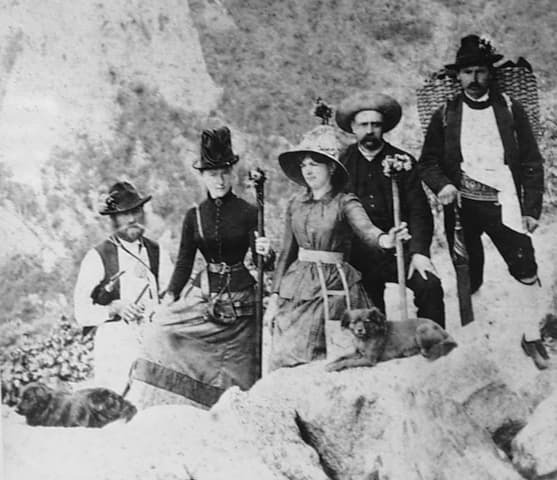 During September of 1867, the Empress visited Greece to visit many classical sites, as well as Corfu. 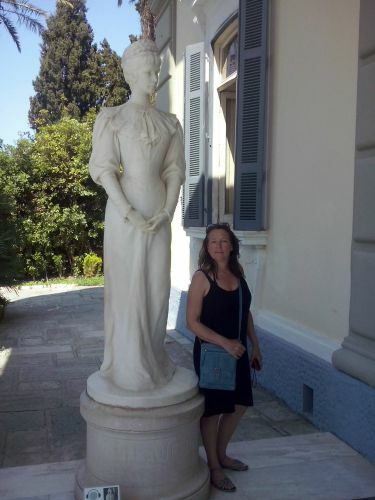 She fell in love with this beatiful Greek Island, and between 1889-1891, the Achilleion Palace was built, a lovely little palace dedicated to Greek history, culture and mythology that she admired so much. Sisi would visit the palace frequently. If you have a change; go see this palace! Since it is designed by the empress herself it is very special and intimite. If your cruisship docs the port of Corfu you can take a tour accross the island with a private guide. It will also take you to the Achilleion Palace. In addition to Greece Hungary was also one of the favorite ‘holiday' destinations of Sisi. The first official visit of Sisi and Franz Joseph to Hungary in 1857 ended disastrously. Her daughters Sophie and Gisela both got ill, and Sophie eventually dies from an abdominal infection on May 29, 1857 in Buda. After this tragic incident, Sisi was suspended from parental authority by her mother-in-law, and it was the start of one of her many depressions. Despite this tragedy Sisi fell in love with Hungary and the Hungarian people and she travelled there often and spend a lot of time there. When the pair in 1867 was crowned as King and Queen of Hungary, they got the baroque castle Gödöllö as a gift from the Hungarian government. This Castle lies 25 km from Budapest, so it is ideal for a day trip from Budapest. You can combine a trip to the Godollo Castle with a visit of the lovely town of Szentendre on this full day private tour from Budapest. Or combine the visis of the castle with an exciting Hungarian horse show. Switzerland is a popular destination of the Empress. Of course it is known for the tragic assassination of Empress Elisabeth in Geneva in 1898. She was travelling incongnito under the name Countess Hohenembs (as she often did). 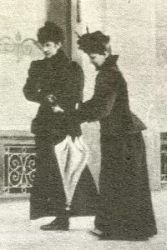 She was walking from the Hotel Beau Rivage towards the steamer that should bring her back to Montreux after a visit with Baroness de Rothschild. 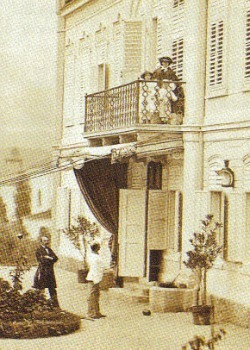 After she is stabbed by a mad anarchist, she is brought back to Hotel Beau Rivage. She died there from the deadly wound in her chest. Sisi did stay in the Hotel Beau Rivage often, and they keep her memory alive. They offer historic suites called after iconic characters that stayed at the hotel. One of these is of course the Sissi suite. 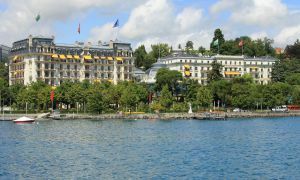 Other Swiss hotels that she stayed in are the former Grand Hotel in Territet and Hotel Baur au Lac, a famous luxury hotel with views over Lake Zurich and the Alps. Sissi spends the summer of 1875 in Brittany (France). She was accompanied by her daughter Maria Valeria, and some 70 servants. She rented the Chateau of Sassetot-le-Mauconduits and spend her days horse riding and bathing in the sea. Rumours were spread that she had given birth to a child, whose father was reputed to be Andrassy the Hungarian politician, although this was not in fact true. You can have a similar holiday, since the Chateau de Sassetot is now a luxury hotel and is also known as Château de Sissi. 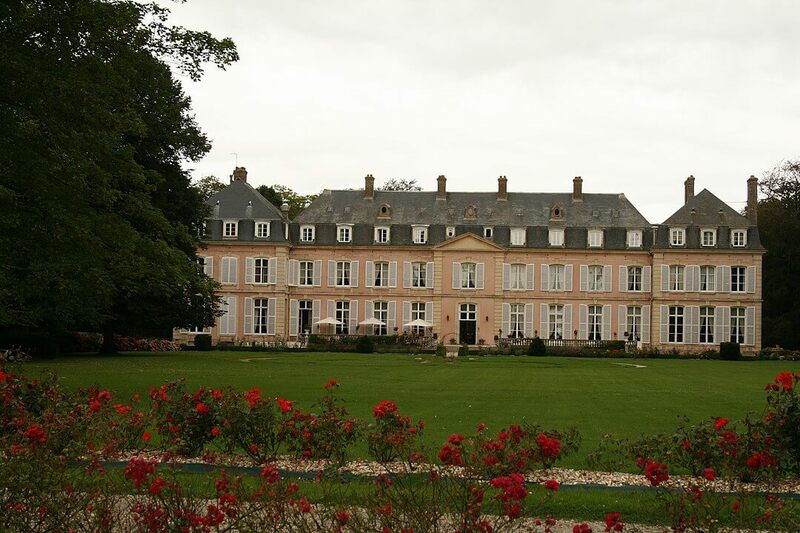 It is located just 1 mile from the beach, and horse riding treks depart directly from the Chateau. Sisi had a had a bad fall from her horse during this period, which which resulted in concussion; so please be carefull!